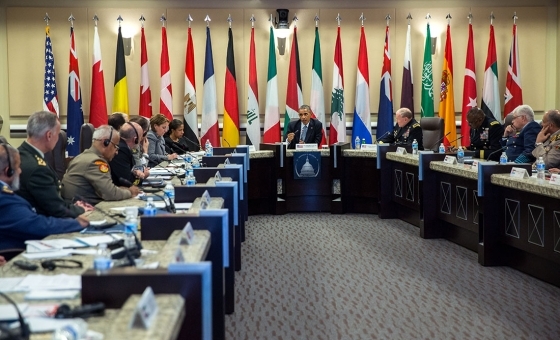 President Barack Obama participates in a meeting hosted by Gen. Martin E. Dempsey, Chairman of the Joint Chiefs of Staff, with more than 20 foreign chiefs of defense to discuss the coalition efforts in the ongoing campaign against ISIL. Gen. Lloyd J. Austin III, Commander, U.S. Central Command also participates in the meeting at Joint Base Andrews, Maryland, Oct. 14, 2014. Defence chiefs from around the world gathered at Joint Base Andrews, Maryland, Tuesday to meet with US President Barack Obama to discuss the Islamic State of Iraq and the Sham (ISIS) threat. The meeting will discuss a strategy to “degrade and destroy” the extremist militant group. More than 20 nations, including Egypt, were represented in the meeting, as part of the US’ “broad international coalition” to confront the group, which has modelled itself as ‘Islamic State’. The nations represented at the meeting besides Egypt and the US were Australia, Bahrain, Belgium, Canada, Denmark, France, Germany, Iraq, Italy, Jordan, Kuwait, Lebanon, the Netherlands, New Zealand, Qatar, Saudi Arabia, Spain, Turkey, United Arab Emirates, and the United Kingdom. Addressing the representatives at the meeting, Obama said: “this is going to be a long-term campaign” adding that “there are not quick fixes involved”. US Secretary of State John Kerry said last Sunday that Egypt’s role as “an intellectual and cultural capital of the Muslim world” is highly important in “in publicly renouncing the ideology of hatred and violence that [ISIS] spreads”. He stressed the importance of Egypt’s religious institutions such as Al-Azhar and Dar Al-Ifta in supporting this effort. 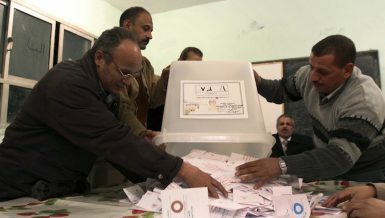 Whether or not Egypt will play a military role in the “broad international coalition” is unclear. 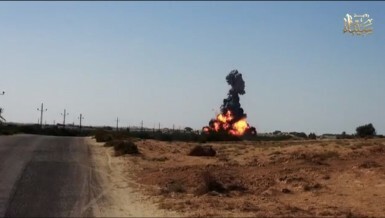 Foreign Minister Sameh Shoukry said in September that Egypt has to “fight its own battle against a common enemy”, referring to militancy in the Sinai Peninsula. President Abdel Fattah Al-Sisi refused to comment during an interview on US television, also in September, if the US “needs the Egyptian air force” to carry out strikes on ISIS. He stressed that Egypt is “in a real and serious confrontation with terrorism” highlighting that Egypt is part of the coalition. Kerry, who met with Al-Sisi in Cairo on Monday, said that 10 Apache helicopters would be delivered to Egypt in November. The US suspended the delivery of military equipment to Egypt in October 2013 pending Egypt’s democratic progress. The White House reported that nine countries have conducted “flying sorties” so far in the campaign against ISIS. Most recently coalition airstrikes have been carried out in Kobani on the Syrian side of the border with Turkey and in Iraq’s Anbar province. Obama confirmed airstrikes would continue in both locations. Arab Gulf nations and Jordan have been assisting the US in carrying out airstrikes in Syria, where as western nations have only been intervening in Iraq. The US is the only nation carrying out airstrikes in both Syria and Iraq. At the end of the meeting, Obama said he was “encouraged by the unanimity of viewpoints and the commitment of the countries involved to make sure that we’re making steady progress”.